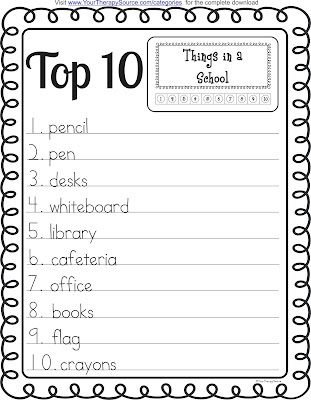 Challenge executive functioning skills and handwriting with this Category Game Top 10 Challenge Freebie. This free download includes a single lined recording sheet and 6 category cards. This is game is suitable for 1 player and groups. Just print enough recording sheets for each player. If you do not want to write the words, grab a hole punch. Punch out the number in the category card each time you say a word from the category. If you don’t have a hole punch, color in each circle.